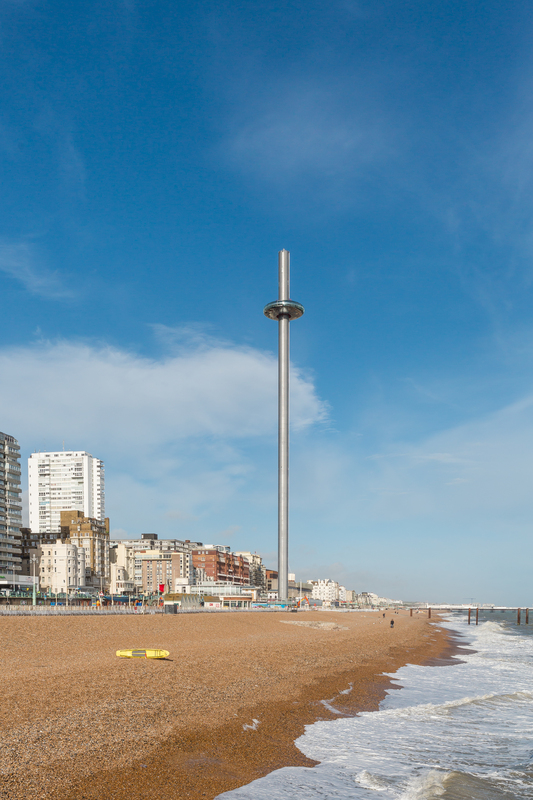 The Brighton i360 tower is now officially the tallest structure in Sussex. Having reached 120 metres high the seafront attraction is now taller than nearby Sussex Heights (102 metres) and Shoreham Power Station’s chimney (106 metres). This despite the fact the construction is not yet complete. The i360’s chief executive Eleanor Harris announced the milestone this week. She said: “The i360 is now the tallest structure in Sussex: taller than Shoreham Power Station, which previously was the tallest structure, and Sussex Heights, which was the tallest building in Brighton and Hove, and other famous landmarks such as Chichester Cathedral and the Gatwick Air Traffic Control tower. “We are on schedule and have less than 50 metres of tower to build, and we expect to complete the 162 metre high tower by the middle of September if not sooner if the weather is good. “Up close the tower is an incredibly elegant and beautiful piece of architecture soaring up into the sky and it will be fantastic to see the tower revealed in all its glory when the square jacking tower (used to build the tower) is removed next month. The first steel sections of tower, or cans as they are called, were lifted into place using the giant 100 metre high crawler crane, nick-named T-Rex by the site team, but as the tower reaches higher into the sky, the jacking tower, designed by the i360’s main contractor, Hollandia, is being used to lift the tower up, allowing a new can to be skidded in underneath. The new can is bolted into place, and this process is being repeated until all 17 cans are adjoined and the i360 tower is complete. Segments of the glass pod, which has been designed and built by leading cable car designers POMA, will arrive in Brighton in the autumn and then work will begin on the beach buildings, to create a stunning new events and visitor centre and restaurant. National and international interest in the Brighton i360 is building, with film crews and magazines visiting to find out more from all over the world. The attraction remains on track to open next summer. The Imperial Hotel provides a gateway to a great experience - see a show, attend an event or visit one og Brighton's many tourist attractions. We aim to deliver service with a smile and a fun attitude.